Hamad Shamus remembers the morning in September 1982 when the right-wing Lebanese forces and their Israeli advisers sealed the Sabra and Shatila refugee camps on the outskirts of Beirut and began to massacre the Palestinians inside.His home was nearest to the camp entrance and he was one of the first to hear shots as the Phalangist militia, in uniforms adorned with the Cedar Tree insignia, arrived. The Phalange had been fighting the PLO and its Lebanese allies since 1975 and were seeking revenge for the killing of their leader, Bashir Gemayel, in a car bombing. 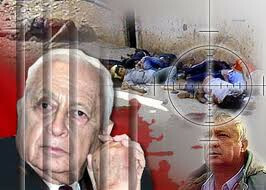 As Israel's top military official in the 1982 invasion of Lebanon and backer of the Phalangists, Ariel Sharon is here thought of as a butcher of innocents. 'He is the King Kong of massacres,' says Abu Khalil, 46, another survivor. Abu Mohammed, 55, looks down the street he helped defend. He had sensed something bad was coming and hid his family. He then returned to his home as the Phalangists and Israelis arrived. He ran to the nearby football stadium, used as a weapons depot before the PLO withdrawal, and found rifles and grenades.